Godfrey Rust is a poet, worship leader, singer and songwriter who has never strived to find fame or fortune in the music world, but has nevertheless clocked up some significant creative achievements. His poems (at www.wordsout.co.uk) have become popular in church events and in particular every year dozens of churches, large and small, make use of his Christmas poems while his collected works Welcome To The Real World is still selling 17 years after it was published. His music with the acoustic duo Shattock & Rust reached a national audience, though in recent years Godfrey has been content to serve his local church in worship. But now Godfrey's years of occasional song writing have borne fruit with the release of his first solo album 'Prayers In Time'. I met up with Godfrey in his home in Ealing, London to talk about his life and music. I began by asking this most experienced of worship leaders what are his thoughts on the current modern worship movement. "Obviously there's a lot of very good material out there. Over the years I've been leading worship, people like Matt Redman, Stuart Townend, Chris Tomlin, the Hillsong writers and of course Graham Kendrick have written brilliant songs, with some great lyrics. They've changed the landscape. But I find these days that the range - the theological range, the emotional range, the spiritual range - seems just to be getting narrower, almost as if it's aiming for the lowest common denominator. Experience rules over content and I'm not sure that's a good thing. What is an act of worship? My understanding is this: you're coming into a church or into a place where you are coming before God, and you are saying 'You are God and this is me, and this is how I'm responding to you.' That response may be praise and worship and saying 'God, you're amazing,' or saying 'God, what the hell's going on?' Or it may be saying 'Please do this' or 'Thank you for doing that' or 'God why and where are you - do you even exist?' or all of those things and more. We look at the Psalms and the book of Job and the prayers and psalms throughout the Old and New Testament, there's an extraordinary range of expression of worship. Songs can also work in three quite different directions. Most contemporary worship songs are simply directed to God; but we can also be encouraging one another - like Paul says, sing to one another with psalms and spiritual songs - to declare our faith, to build each other up. And also we can be talking to ourselves - Psalm 42 - 'Why be downcast within me, oh my soul?'" The 'Prayers In Time' album is subtitled 'Songs Of Hope And Grace'. The songs on the project clearly take on a far wider lyrical sweep than most modern worship songs and most could quite reasonably be called modern psalms. Godfrey continued to talk about the Psalms and his approach to songwriting. "The range that we see in the Psalms is extremely broad in terms of subject. Nothing is off limits. What seems to have happened in recent years is we've reduced sung worship to a set of very much God-focussed, awe and worship and repentance and thanks kind of songs, the aim being a particular kind of inspired worship experience. That's great as far as it goes, but it's only one slice of life. Plenty of people are already doing that much better than I could, so I don't see any point in just adding more of the same. "Over the last decade I've been involved with our Café Church which is a very eclectic community. At St John's in Ealing we have a soup kitchen, it's been going for 40 years. We started Café Church because people would come from the soup kitchen and wander into church and we thought, why don't we do something that actually works for them? We sit in the lounge around tables and we have coffee, doughnuts, and it's kind of a normal service format, but it's more interactive and anything might happen. It's a very mixed bunch of people who come, often people who feel marginalized by both society and church, including people like myself and others of my generation who've got a bit stale with conventional traditional worship. We've heard the same sermons 97 times and we've sung the songs again and again and that's fine, but if we're honest they often haven't made that much difference to us, and there's a lot more going on that we don't take account of. So coming to Café Church and leading music there as I've done now for 10 years more or less every week, with a fairly random bunch of musicians including whoever might get up and join in at any time, you are constantly challenged how to do stuff that will work for this community. How do you address some of the subjects? At Café Church we don't have a worship time when everybody stands up to sing. We used to do that when we started, but over time people would just sit down, drink their coffee, maybe sing, maybe listen. When people get a bit worked up they will get up and dance around and that's great. It's much more informal and inclusive - you don't have to buy into a particular experience." How, I asked, has Café Church had affected his songwriting? "It created for me a context where if there isn't a song about what we're talking about, I write something for it, and I'll use styles like blues or rock and roll which work for many of those there. For example 'Lay Down My Angry Heart' was written when we were going to talk about anger one night. I don't know any suitable worship songs about anger. Or sometimes we get the people there to help write it, which happened with a couple of tracks on the album - 'Rock Bottom Blues' and 'Save Me From My Enemies', writing lines down on post-it notes and then gathering them up. It's a context within which I'm trying to write or adapt songs that may give the people there some things to hang on to, and express the Gospel in its variety and be authentic to our experience. We mix things as much as we can. It's a mix of worship for people to join in, and 'performance', communicating to people. The dividing line between those two is blurred. We still sing a lot of contemporary worship songs and traditional hymns - I've never heard Café Church singing more loudly than when we sang 'All Things Bright and Beautiful' once - somebody requested it, it's never been my favourite hymn! "I'm always looking out for worship songs that are a bit more edgy - like Stuart Townend's "Come All You Vagabonds" or stuff by Godfrey Birtill. We also like belting out the old Billy Graham-style songs like 'When The Roll Is Called Up Yonder' or old Sunday school songs like 'Give Me Oil In My Lamp' - a lot of people there are in their 50s or 60s - and we sing popular songs like 'Bridge Over Troubled Water', 'You've Got A Friend' or 'Lean On Me' which make sense in a church context. We sing some Van Morrison and Dylan. One night we finished off with a Bob Marley song and the Polish national anthem. Anything might happen. If somebody gets up and they want to do something, if it's not going to completely destroy the place, why not let them? It's not about pre-packaged and rehearsed experiences. You're encouraging people to share, to participate, to belong, to be heard, as well as of course to turn their thoughts to Jesus and to welcome the Holy Spirit. They don't have to share within a narrow theological boundary. It's important that people feel loved and accepted because then you create the environment within which communication and faith can happen." I asked Godfrey which songs on 'Prayers In Time' are targeted at the people in his church and which songs are expressing personal feelings and insights. "I think they're the same thing. 'Angry Heart' for example, I wanted to write something on this theme personally. Anger is a complicated subject. We all suffer from it in different ways, and there's a lot of me in that song. 'The Sound Of Heavy Rain' was sparked by a line from a sermon by a friend - it touched a spiritual longing in me, and I hope expresses that in a way that others can join in with. All of these songs have been written to communicate to God and to other people in different ways, addressing all sorts of different things, as the psalms were, but they are also me trying to express different feelings I have. A song is only going to work for others if it's also something I want to say. I don't turn dogma into song hooks." 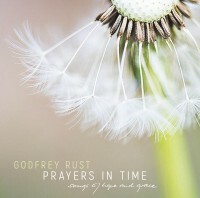 The theme of several of Godfrey's songs are expressions of the paradoxes of faith. He commented, "The track 'Healing Touch (The Theologian's Prayer)' is unusual, and for me it's definitive. It started life when a friend at St John's wrote a very simple little chorus, 'I can feel the touch of your presence healing me' and I put it to music and we sang it like that. Then I recorded it, and put some other very positive biblical words to it as a verse - as high as the heavens are above the Earth, don't worry about tomorrow - great messages of the Gospel; but at the same time in my mind are always the questions and contradictions we have to live with, problems of suffering and neglect in a world supposedly ruled by a loving God. In a sequence of poems I wrote 25 years ago there are two sonnets where I simply list a whole set of Christian paradoxes and oxymorons. I used these sonnets as a second voice in 'The Theologian's Prayer', so the song becomes a dialogue - a voice of faith and a voice of doubt simultaneously, not even arguing because they are talking over one another, not listening to one another. The song is a direct reflection of what's going on in my mind a lot of the time. On the one hand you're saying yes, God, this is the mystery that goes beyond; you've overcome the world, you've overcome death, your ways are higher than ours; but on the other hand, what on earth is this all about? How does this make any sense at all? You don't shut one voice down and you don't resolve them. They live together and they will go on living together. That's OK.
"Most worship music avoids that, but that's not being true to the biblical narrative. Matt Redman's "Blessed be your name" is very popular I think because it doesn't dodge an issue which is a daily reality for most people. The great wisdom literature the Old Testament - Job, Ecclesiastes, the Psalms - isn't afraid to face these issues head on, and that matters because the problem of evil and suffering - 'Good God and a wicked world' - is probably the biggest thing that keeps people away from engaging with the Gospel. For me it was a breakthrough back in the 1990s realising that paradox wasn't a barrier to be avoided, it was a key to open doors of faith. All important Christian truth comes down to believing things that logically cannot be true at the same time - like Christ being simultaneously God and man, the immortal dying, the paradox of predestination or the paradox of evil. What we believe as Christians, technically, is nonsense. I always thought that I would write a book about paradox, but because of Café Church it's turned out to be this album instead." Very recently, Godfrey has gone through some very painful experiences, with his dear wife contracting cancer. I asked him to tell me a bit about that and how it had affected the launch of his album. "In April Tessa was diagnosed with advanced lung cancer, having never smoked in her life. That was completely unexpected. She's relatively young and healthy. The album was going to be dedicated to her anyway and if I'd been writing an album of songs for people in our situation, these are the kind songs I would have written. The timing of so many details, including the fact that we received the final master of the album the day we came home from our most devastating consultation, when we discovered how bad it is, for a lot of different reasons is extraordinary. We don't know what to make of that except that we think there's something providential in this. "Going ahead with the launch of it was really important for all of us. The obvious thing would have been to cancel but we thought, no. We're doing this to raise money for someone we've supported for many years. All the proceeds from the album go to support our friend Kenneth Ononeze in Jos in the northern part of Nigeria, where there is often violence from Muslim terrorists." [Shortly after this interview was recorded more than 200 people were murdered in Jos in attacks by Muslim herdsmen on Christian farming communities: Kenneth is one of the Christian community leaders calling on the government to take protective action. ]"Kenneth's been there 30 years, running a church and also building two schools, living hand to mouth in an extremely dangerous situation. His church has armed guards on every week because of the risk of suicide bombs. All the money I make from my music and my poetry has gone to Kenneth. He and his church have done a fantastic job of building these two schools with no money; they've still not finished them. Kenneth and I joked about the fact that I've been working on this album for 10 years, and Kenneth said his friends are so fed up about him talking about money and building they say, 'When are you going to talk about something else?' I said, 'I've finished my album, let's finish your building now.'" When 'Prayers In Time' was launched at Godfrey's church, Kenneth Ononeze was in attendance. This godly and courageous man and his wife Helen, who is a nurse and now oversees the running of the schools, suggested to Godfrey that the earnings forthcoming from sales of the album should not, as had been long-time planned, go to Kenneth for the completion of the buildings, but should instead be spent on medical treatment for Tessa. Godfrey had to explain to Kenneth and Helen that, because of the National Health Service, Tessa was going to receive top-rate medical care. As Godfrey told Kenneth, "We don't need the money but we need your prayers. So now we're in a real partnership. You get all your church praying for us, which they have been doing anyway, and we'll support you with the money you need. That's a real partnership in love, in the Gospel, in hope. The school in Nigeria desperately needs this money. So Tessa stood next to Kenneth at the launch and said, 'I've just been diagnosed with a life threatening disease, but this man has his life threatened every day and has done for years and years.' She was saying that everyone feels so much for me and supports me, but this man is a brave and courageous man of God who needs more support. When you've had a devastating diagnosis yourself and then stand up and say that, it is the Gospel in action. They need about £14,000 to finish building and I hope that this album will finish it. On the basis of the initial response, it's looking good. The whole situation is bittersweet because of what's going on." 'Prayers In Time' has taken a long, long time to make. Said Godfrey, "It started more than a decade ago. I got some basic recording equipment, primarily because both my sons were teenagers at that time and were getting into music and the idea was for them to be able to do some recording with their friends. But I thought, with not having recorded for quite some time, and I'd been writing a few songs, I started messing around with this. Gradually I had the idea that I'd like to put a few songs together. I had the idea about modern Psalms." The album is very much a family affair. Explained Godfrey, "My three children are all musicians, two of them professionally, and a lot of their early experience came from the church worship band. I lead and play guitar mainly, so when Emma came along, our oldest child, she played piano. Then Joel came along and played bass. We had to have another one so someone could play drums. Adam was handed the drumsticks when he arrived. For several years, when I was leading worship, they would be the band. Adam started playing piano and by the age of 14 or 15 he decided that music was what he wanted to do as a career. He's now a music director, producer, arranger and session musician and halfway through he took over as producer of this album. It's an interesting dynamic, father and son working together, and wasn't always straightforward! Adam did a terrific job with material that was mostly not of genres he was used to working with. He played all the keys and programmed the rhythm and bass tracks, and worked on arrangements with fine musicians like David Fitzgerald and guitarist Daniel Corbett at a level beyond what I could do. Joel is now doing a PhD as a classical composer in New York - he and his wife Laura and her cousin Neena Caperna all sing vocals on 'Prayers In Time', as does my daughter Emma and our cousin Jess Duckworth. After a lot of work over a long time it's been like another family member, this album." Godfrey returned once more to the songwriting process. "My main focus has always been on the lyrics. I tend to write story songs, songs which start somewhere and go somewhere else, rather than songs which take a single idea or hook and just go round and round embellishing it. I've been doing the same for our Messy Church, as there seems to be a dearth of good songs for children and especially families. You have the story and a nice chorus and you put in some jokes and angles that adults will also appreciate. Messy Church isn't just for little kids, it's for families. So you want things that the kids will like and can bang tambourines to, but also that adults can think is not patronizing. At Café Church we've brought together a group of musicians called the Men And Women Of Uncertain Age. We get together every couple of months: there are about a dozen members who each turn up when they can. There are people who've been around in Christian music for ever, like Simon Dennis who works with Graham Kendrick; David Buckley; Steve Weeks. It's the first time I've fronted a band. Café Church is somewhere you can do eclectic things. I've now started writing songs for that group because I know they will come in without rehearsing anything and if I have a simple set of chords they'll make a great job of it. I'd like to record a new batch of songs with them that are more bluesy, all live instruments. At the moment I've got more than enough stuff written for several albums but with our new family situation I don't know where that will go except that I'm carrying on with Café Church. I'm enjoying creating music more than ever, though. It's my way of praying, of responding to God." In the introduction to the album, Godfrey writes, "The album is a journey in two stages, one that in our lives may be repeated many times, starting from any point." He went on to explain what he means by that. "A lot of creativity, a lot of art, comes out of conflict. The songs on this album come out of the conflict between faith, hope and love and their opposites - doubt, despair and rejection. I think that's the human condition, and whether someone is Christian or not, we live with those opposites on our life's journey. The album starts with five songs that reflect those contrasts, that set out the stall, if you like. The last five songs then take us through some responses, which are expressed generally in Christian terms, but which I think are again pretty much universal - we can forgive, we need spiritual resources, we can take responsibility, we can meet other's needs, we can be gracious. Those things are keys to our spiritual and emotional and communal health. So the whole album is a journey, a kind of song cycle, that doesn't just go from beginning to end and stop but which can repeat over and over in anyone's life. "These songs all start off with problems and never completely shake that problem off, but they all finish with hope, with grace - that's why the subtitle is what it is. They're all saying no matter how bad it gets, there's a way through that we can make sense of it. I think 10 years ago, when I was first doing this, I expected this process may be a part of my travelling away from faith. In fact, what it's done is it's led me further on, to a different understanding of it; into a more real and more helpful understanding of what is important. Our bucket list is faith, hope and love. I've got lots of friends who still want to do and achieve all kinds of particular things before they die, but I've done the projects I really wanted to - I've done my professional work and my poetry and music and for sure, I'm going to carry on doing that stuff, but what I really want to do with the rest of my life is to experience and give more faith, hope and love because that in the end is what remains. It's all about relationships. The whole process of this album has been very important for me personally, working through all that, finding a way of expressing that." Godfrey returned to his hopes for 'Prayers In Time'. "I've no idea if this album will have any significant reaction from a wider audience. I'm perfectly prepared if it won't because the whole world puts out music, and this isn't a formula worship album. If there isn't, that's fine. It's been worthwhile. It touches people that I'm currently with and I know from their reactions that it will touch some others. If a couple of the songs get picked up and used by other people, that's what I'd be happiest about. We'll be putting some tracks out on Youtube with lyric videos for that reason." Which of his songs does he think have potential for wider use? "I'd love to hear covers of 'In Need Of Grace'. It's probably the one track on the album that you could play to anybody anywhere: it doesn't need a Christian context. When we sing it at church it's called 'I Need Your Grace'. I wrote it as a prayer, and then I realised when I was playing it in some other context, that phrase completely changes the dynamic, so I wrote the alternative lyric 'I'm In Need Of Grace', which is the one we recorded because that has a much wider, inclusive appeal, and it's also about 'I'm in need of being gracious' - not just that I need grace from God, but I need to be gracious in all my dealings with others. Adam and I may release the version with 'I Need Your Grace' for people to sing in church if they want to. It sums up much of what I'm trying to do. It's a song that works in a very conventional Christian environment but it's also inclusive. I hope my songs touch people, draw them into what the gospel is without having to immediately buy into certain theological assumptions. They can feel the grace of God without naming Jesus; they may call on the name of Jesus later, or they may not." Godfrey concluded by talking about what he thinks is the strongest song on the album. "I'd also love to hear churches and gatherings everywhere singing 'Lord, Where Did You Leave Your Hands?' I'd love to hear a gospel choir version of it. Something that we're really lacking - I've been a worship leader for many years - when you're looking for songs, is that there are very few which are about us practically serving people, serving one another, that work and are not corny. The best songs I know on that theme are the Prayer of St Francis and Kendrick's 'Beauty For Brokenness', but the latter is a catalogue of specific situations, something I also pick up in the track 'Open Doors'. 'Hands' is more generic. I wrote it one night at Café Church while someone from central Africa was speaking about the impact that their being a Compassion child had had on them and also on their whole family and community. The theology of Teresa of Ávila, of our being the hands and feet of Christ, is so important and it's what people find most attractive about church and the Gospel. Having a song like that that people can sing joyfully but also has that message has been a really good thing. We sing it a lot because it's never irrelevant. I hope it travels." As always, Godfrey at his best, being so real and honest about himself, his faith, his family, his friends and viewing the world with eyes and ears that have given him and now us, true insight into the way things really are - then giving his all to make the world a better place. Thank you Godfrey. New American pop singer/pianist RONNIE FREEMAN fielded some probing questions from David Bain.